Dr James Calvert qualified from Oxford University in 1992. He spent a year at Harvard University in their Masters Programme before completing a PhD in London & Cape Town. 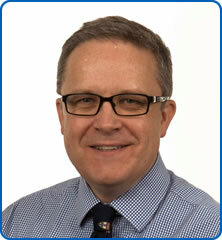 He is National Audit Lead at the British Thoracic Society. Since being in Bristol Dr Calvert has developed a number of programmes to improve patient safety. He works closely with GPs in Bristol to improve pathways of care for people with lung related problems.